Anti-white marks & yellow stain protection. Restores natural pH. Keep skin healthy. Dermatologically tested. 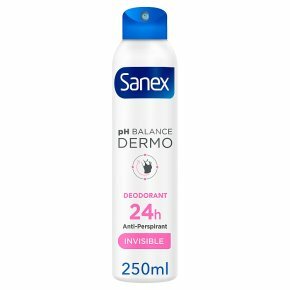 For invisible, round-the-clock protection, try Sanex Dermo Invisible Anti White Marks 24H Anti-Perspirant. Dermatologically tested, with 0% alcohol, it's kind to clothes and gentle on skin leaving you healthy, dry and fresh for a full 24 hours.